Aerate in style with the Ryan® Bluebird H424 17.5" Residential Plugger. This is a walk-behind aerator that is both easy to use and durable. This product was designed for commercial use and has patented free-wheeling outer tines giving you optimal maneuverability. 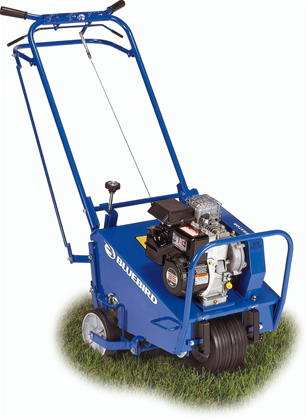 The Bluebird is compact in size for an aerator, yet generous in aerating pattern and productivity. This aerator is ideal for homeowners and landscapers alike who want a powerful and compactly-designed product. Depth controls give precise and consistent coring depths up to 3"
Aerating Pattern: 4.4" x 7.8"